The Big Island of Hawai`i produces some of the "richest" coffee in the world, comparable to any of the more famous coffee regions. Hilo Coffee Mill (founded in February 2001), is located on 24 beautiful acres in Mountain View with a full viewing area and tasting bar and was founded to help small local coffee farmers not only produce and process their coffee crops, but also assist in marketing these valuable crops to the rest of the world. It is our passion for excellence that now brings these coffees to the forefront of world markets, and adds Hilo and East Hawai`i to the list of "best coffee growing regions worldwide". Hilo Coffee Mill supplies you with superb Hawaiian and worldwide coffees, at the best possible prices, and keeps the spirit of the family-run coffee plantation alive and well. Whether you need large or small quantities, Hilo Coffee Mill sells to the public in our Roasted Coffee section. Either way, you can be assured of the finest green and small batch roasted coffees available. We appreciate your business and look forward to doing business with you for many years to come. Mahalo for visiting our website and experiencing some of the wonderful tastes of aloha and from around the world. If you're ever in the Hilo area, come by and see us! Have espresso drinks made from our very own espresso blend, smoothies, ice cream, lite snacks, take a tour, see our cage-free chickens, pet our cats! Have fun. We promise this will be one or your Hawaii highlights. We're located between the 12 & 13 mile markers at 17-995 Volcano Highway, on the left side of the highway if you are traveling from Hilo toward Volcanoes National Park. See you soon! We are proud to be members of the following organizations. We support local Hawaiian farmers and the tremendous effort they put forth to bring all Hawaiian coffees to the forefront of the world coffee market. The SCAA is the trade association for the specialty coffee industry, one of the fastest-growing food industries in the world. One of the SCAA's primary functions is to set the industry's standards for growing, roasting and brewing. Members of the SCAA include coffee retailers, roasters, producers, exporters and importers, as well as manufacturers of coffee equipment and related products. The Hawaii Coffee Association (HCA) represents all members of the Hawaii Coffee Industry. The HCA’s focus is promoting Hawaii as a coffee origin and to increase Hawaii Coffee consumption within the State and export from the State. A major component of the HCA’s work is education of the public and of members. The Hawaii Organic Farmer's Association's mission is to protect the life of the land and the health of our communities through education about organic land care practices. Developing and strengthening certified organic farms will enhance Hawaii's many fragile ecosystems and be a base for a local sustainable economy. The Hawaii Farm Bureau Federation (HFBF) is a grass roots non-profit organization founded by Hawaii farmers and ranchers and working with organizations, communities, and individuals involved in all aspects of the agricultural industry in Hawaii. 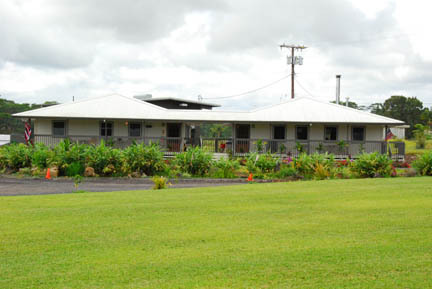 The HFBF is organized for the purpose of unifying the county farm bureaus, thereby enhancing the knowledge, economic opportunity, prosperity, well being, and happiness of its members; to analyze and resolve the problems that face agriculture through effective cooperation, planning and representation; to ensure the protection and health of Hawaii's agricultural resources and the environment today and in the future. Farm Bureau is local, statewide, national, and international in its scope and influence. The Hawaii Island Chamber of Commerce (HCA) is an organization composed of business and professional people in the community who work together to make Hawaii Island a better place to live and do business. The Hawaii Tea Society (HTS) is a non-profit organization organized by tea enthusiasts in the State of Hawaii with advice from the University of Hawaii at Manoa, University of Hawaii at Hilo and the USDA Pacific Basin Agriculture Research Center (PBARC). It's main purpose is to promote the orderly development of tea culture and industry in the state of Hawaii. The Hawai`i Visitors and Convention Bureau (HVCB) Working closely with the Hawaii Tourism Authority, HVCB is a nonprofit organization whose sole purpose is to promote our islands to travelers throughout North America – Hawaii’s largest and most important market.